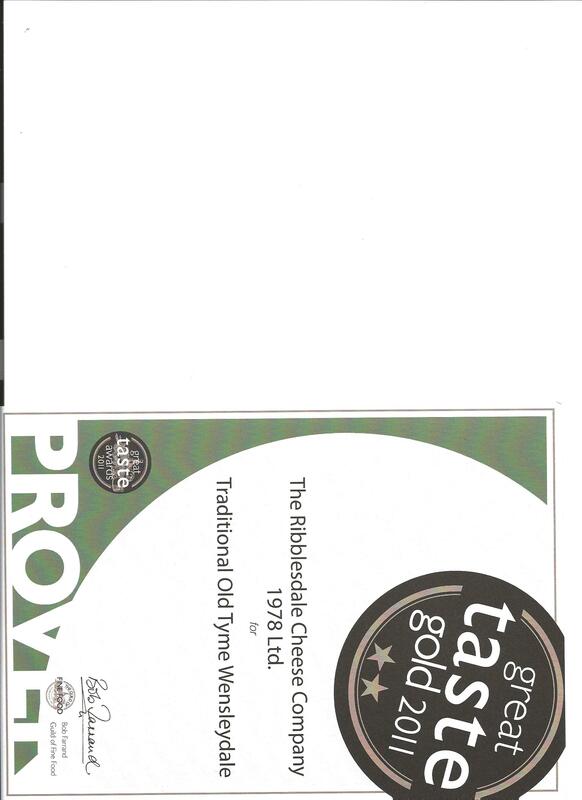 Here is our two gold star Great Taste 2011 award for our Old Tyme Wensleydale. It is a long, slow, traditional make, taking possibly twice the length of most commercially made Wensleydales and this is why we call it Old Tyme to demonstrate that it is a long, slow and gentle recipe, giving the milk a lot of respect, and preserving the rich creaminess and time to develop the flavours and the texture. One of our Trading Standards officers got very confused as she thought that the Wensleydale had thyme in it and it took a lot of persuading her to read the label properly to show her that it was not spelt as ‘thyme’. We use local cow milk that comes from a small herd of pedigree Friesian cows about 9 miles away from our dairy in Hawes, making a very short supply chain. The cows are looked after by our supplier farmer who is so shy, he does not like to be named and he has won prizes for his herd. The quality and colour of his cow’s milk always amazes visitors – it is golden coloured which shows in the cheese that we make. So many of the wensleydales you can buy in the shops are almost white in colour. Our milk is always high in fat and protein which is what we need to make a first class cheese. Mark, our part timer made some wonderful vanilla ice cream from some of our cow’s milk and his own free range eggs which was such a wonderful colour – rich, creamy and golden. We were extremely pleased to win an award for our Wensleydale as we are known to be specialists in goat cheese. I am hoping that this will be a marvellous opportunity to show our customers that not only are there two cheese makers in Hawes, we also make award winning Wensleydale. When you cut our Wensleydale, you can see the ‘feathering’ showing the crumbliness. It is nicely balanced between being creamy, crumbly and rich, something that was picked up by the Great Taste judges and I am sure that a lot of that is down to the quality of our milk – like our goat milk, it is a single source of milk from a small, very well looked after herd. We make a natural rinded matured version of this cheese which is matured to about 9 months and is very firm, even more golden coloured than this younger version and still slightly crumbly. We also make a Blue Wensleydale which has a lovely, rich and creamy base. Very creamy with lovely length that builds beautifully. We think the colour of the wax reflects the youth of the cheese. Moist and crumbly as it’s meant to be with the balance being held nicely consistent throughout the whole cheese.